In 2015, the Law on Promotion of Women’s Occupational Activities was established in the Diet. “Women’s success” can be seen so often in our daily life that we can see the high degree of interest in the country. In Fukuoka, the Fukuoka International Women Symposium (hosted by Fukuoka Prefectural government) was held on Sep. 9th, 2017, and a message was sent to create a society where women can actively participate. Participants in a wide range of age ranging from junior high school students to elderly people were seen in the symposium. It is understood that “women’s success” is a theme that is attracting interest regardless of gender or age. Therefore, we will consider the current situation of women’s labor participation rate and the collaboration of public and private sectors toward the promotion of future women’s success in Fukuoka City. Photo: Provided by the City of Fukuoka. In Japan, discussions on the success of women have been repeated since the establishment of the Equal Employment Opportunity Law of 1985 (Cabinet Office Gender Equality Bureau). In particular, since 2015, efforts in a wide range of fields are accelerated, from efforts relating to women’s working styles to improving female human resources and living. In August 2015, the Law on Promotion of Women’s Occupational Activities (http://www.mhlw.go.jp/file/06-Seisakujouhou-11900000-Koyoukintoujidoukateikyoku/0000095827.pdf) was adopted, followed by “Fourth Basic Gender Equality Plan” (http://www.gender.go.jp/about_danjo/basic_plans/4th/pdf/print.pdf) in December 2015 and “Priority Policy for Women’s Success 2016” in May 2016 (http://www.kantei.go.jp/jp/headline/brilliant_women/pdf/20160520honbun.pdf), which illustrates that the momentum to promote women’s success is cultivated more and more. Looking at the contents of a series of laws and policies, a single word “women’s success” raises many topics such as separation of roles between men and women in housework and childcare, nurturing female leaders, and support for childbirth and raising children. In addition, each topic is closely related and it is necessary to consider multilaterally. 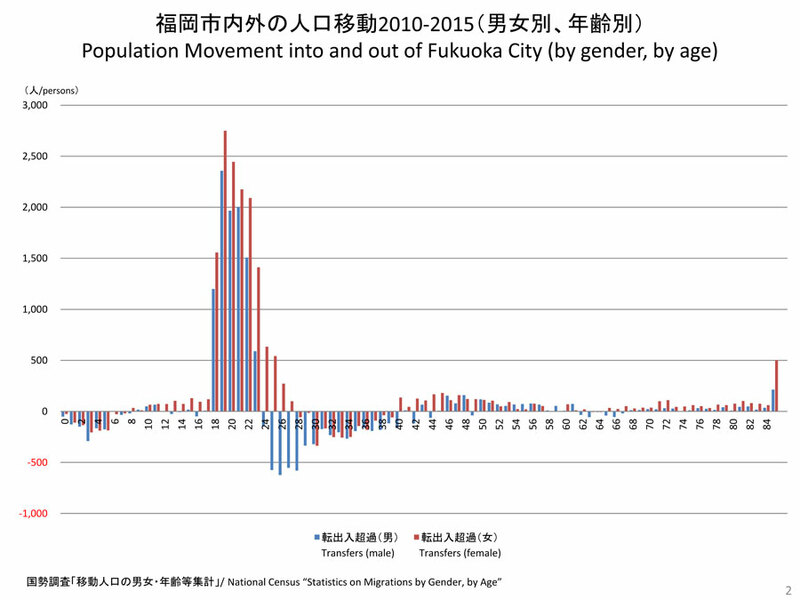 Speaking of Fukuoka City, the female production-age population (15 to 64 years old) exceeds men and this tendency has long been apparent, and therefore, we should take into consideration women’s labor participation as the start point. First, we examine the population composition of Fukuoka City. Fukuoka City is a city with a large number of female population, resulting from many women transferring from other areas in Kyushu region to Fukuoka City (“Prospering City / Waning City” p.87). Now let’s look at Fukuoka City’s internal and external migration numbers by gender and by age. As shown in the graph, for both men and women late teens to early twenties (18 to 23 years old) show significantly exceeded transfer-ins, with the number of women exceeding that of men. Many young people are moving to Fukuoka City as they enter vocational schools, junior colleges and universities, or start to work after high school and vocational school graduation. Also, for late twenties (24 to 27 years old), more women move in, while more men move out. After graduation from university, many men find employment outside Fukuoka City, whereas in the case of women there are people coming from outside the city for employment. Speaking of the thirties, although both genders show more transfer-outs, there are not many outnumbers compared with the number of transfer-ins. 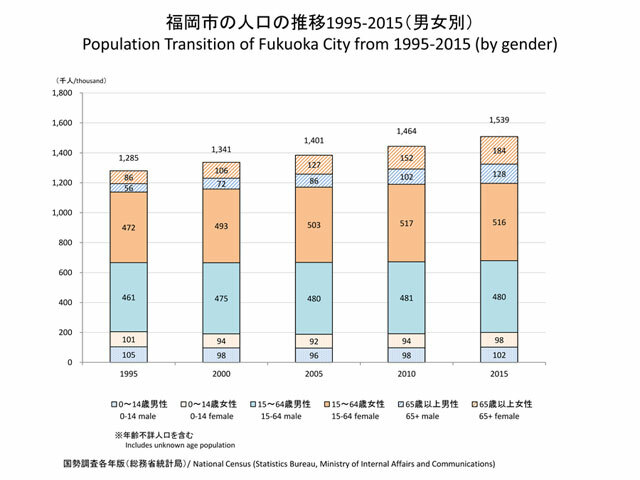 It is clear that many of the women who have transferred to Fukuoka City for university or job continue to live in Fukuoka City. Many women live in Fukuoka City, mainly from the production age population. 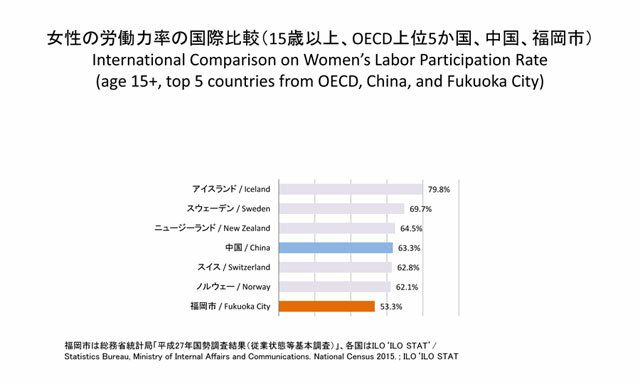 Therefore, paying attention to working women, we find that the labor participation rate (labor force rate) of women in Fukuoka City is 53.3%, 3.3 points higher than 50.0% of the country (Calculated from the “Census 2015”) . However, the figures in Fukuoka City are no higher than women’s labor participation rates in 35 OECD countries. It is 26.5% lower than Iceland (79.8%) with the highest labor participation rate, and Fukuoka City is ranked 20th in the ranking. On the international level, it can be said that Fukuoka City is still in the progress of becoming a city where women can actively participate. However, from the Fukuoka City women’s production age population number, it is considered that there are many female talented people potentially. There should be a way to make use of these female human resources. At the Fukuoka International Women’s Symposium discussed at the beginning of this paper, it was pointed out that women spend a lot of time doing housework and childcare overseas too, making it difficult to balance work with work. Women’s labor participation is a hot topic not only within Japan, but also overseas. Let’s turn our attention to foreign cases. In particular, we focus on Asia where economic and human exchange are active with Fukuoka City. Within Asia, the high participation rate of women in China is prominent. According to the ILO estimate, the labor participation rate of Chinese women in 2016 is 63.3% (ILO STAT). This number is the fourth highest after Iceland, Sweden and New Zealand, which occupied the top of the graph in the previous section. Why is the female labor participation rate in China so high that it is comparable to that of OECD countries? According to a previous study on gender in China (* 1), there are many cases where parenting support by grandparents and relatives is secured. Traditionally, these family systems have supported women’s labor participation in China. In recent years, the momentum to support working women by companies themselves is becoming popular. Among the rapidly growing Chinese enterprises (* 2), large companies such as Ctrip and Jindong Group (JD.com) have set up daycare centers in their workplaces and employees securely leave their children, enabling employees to come to work together with their children and still focus on the work. (Ctrip: Xinmin Evening News, Jindong Group: People’s Daily Online). DiDi has opened a daycare center during the summer holidays and established a system to support employees even during school vacation seasons (China Net). These cases show that private enterprises are also important players for enabling women to work more easily and create an environment where children can be raised easily at the same time. * 1 Yasuko Miyasaka (2007) “Childcare in China – Focusing on Gender and Relative Networks” (ed. Emiko Okami, Mari Yamane, Yasuko Miyasaka “Asian Families and Genders” Keiso Shobo, pp.100 – 120). * 2 Chinese enterprises: The Jindong Group (JD.com) is China’s second largest online retail company. Ctrip is a comprehensive travel company that operates China’s largest online travel site. DiDi is a leading ride-share company in China. * Referred to the report on the case studies of Chinese companies by our intern, Ms. Jia Chunhui. In Fukuoka City, “Basic Plan for Gender Equality (Third)” was formulated in March 2016. Efforts are underway towards the realization of a gender equality society where everyone is compassionate towards the realization of “Universal City / Fukuoka,” a friendly society to all people. Furthermore, in addition to these public measures, there is a high possibility of developing initiatives to support working women by companies, as in the case of China in the previous section. In that case, it will be a stronger support measure if the government and the private sector collaborate. Traditionally, Fukuoka City has been working on industry-government-academia cooperation on important policies of the city as seen in the startup support (“Prospering Cities / Waning Cities” p.68). In other words, in Fukuoka City, the foundation is already in place for public and private sectors and universities to tackle the city’s issues. Each player needs to cooperate not only to implement support measures individually, but also to create ways to promote women’s activities unique to Fukuoka City. Even only one support measure for women’s success is effective multiplied by the number of women to impact and encourage the revitalization of the city. 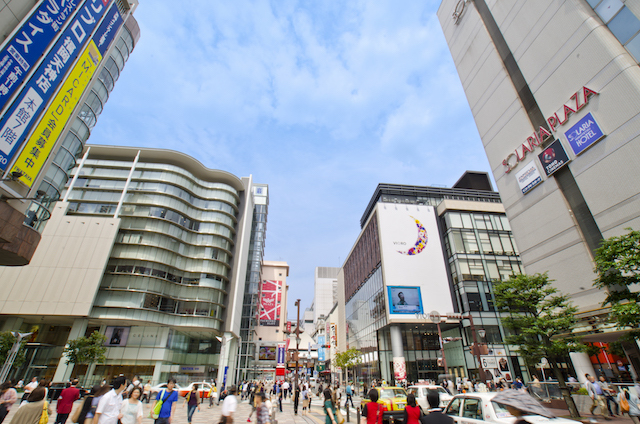 For the growth of Fukuoka City, public and private sectors’ efforts towards future “women’s success city” are expected.